How Much Will You Save When You Move to the Cloud? Every practice is different. The manner in which you manage your practice is going to differ from your colleague across the hall or down the street. 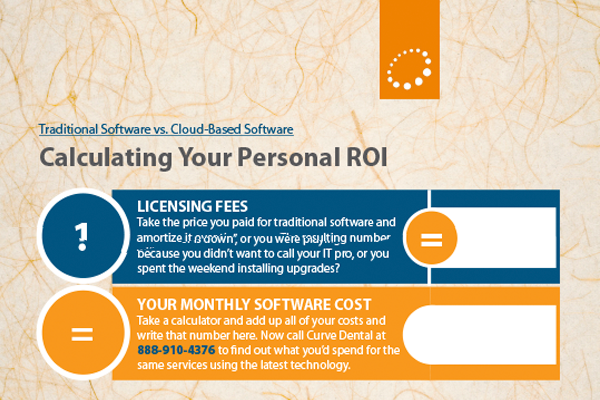 This handy worksheet, Traditional Software vs Cloud-based Software: Calculating Your Personal ROI, will give you a better snapshot of how the cloud may help you spend your dollars more efficiently. Take careful note: Spending your dollars more efficiently may or may not translate into spending less dollars. In some instances the cloud may mean you’ll spend more dollars than you do now, but chances are you’ll be getting more value for the increase in dollars. In some instances you may pay less, which makes the decision much easier. And, lastly, in some cases the difference in costs may be a wash, in which case you may spend the same amount of money for better technology. Do the Math. Call Us To Compare! Once you've done the math to determine how much you already spend on your software, then call us at 888-910-4376. We'll prepare a detailed quote that you compare to what you're spending now. Download your personal ROI calculator today! Download Our Detailed Brochure Today!